Does Britain still uphold the rule of law? By Charlotte Threipland – OpenDemocracy: It is a sacrosanct and founding principle of our constitution. It dates back to the Magna Carta. It is a hallmark of a free and fair society. It represents our final defence against the tyranny of the powerful. And yet, in this age of austerity and the ‘war on terror’, we must ask – does the UK still uphold the rule of law? Equality lies at the heart of the rule of law. From traders in their towers to migrants living on the streets, everyone should be bound equally by and entitled to the laws of the land. Every person obligated under the law should also be able to claim the rights it provides them. And that means justice must be accessible to all. Justice is about protecting the everyday rights of ordinary people: parents fighting to ensure their children’s educational needs are being met, employees protecting themselves from harassment or discrimination at work, tenants being evicted from their homes. Successive governments have chipped away at access to justice. The last coalition government delivered a huge blow to public funding for legal cases in the form of the Legal Aid Sentencing and Punishment of Offenders Act 2012. Now, legal aid is simply unavailable for most types of cases. This means we have a two-tier system of justice: one for the rich and another for everyone else. The Lord Chief Justice recently admitted that “our system of justice has become unaffordable to most”. This attack on equality before the law isn’t just about legal aid. Increases to court and tribunal fees are making justice prohibitively expensive. Despite widespread opposition, the MOJ has now confirmed that it will be increasing asylum and immigration tribunal fees by 500%. Employment Tribunal fees were dramatically increased in 2013. Just one year later there was a 70% drop in claims. The Justice Committee found that these changes have had a “significant adverse impact on access to justice for meritorious claims”. A year and 4 months after it began, the government’s review remains unpublished, even in draft form. One-fifth of courts and tribunals in England and Wales will close by September 2017. This will make it more difficult and expensive for many people to access the courts, particularly those who cannot afford to travel. Although these changes affect everyone, they particularly hurt those who have the highest need for recourse to the law. The MOJ admitted, even before they pushed ahead with the legal aid reforms, that the changes would be likely to disproportionately affect women, ethnic minorities and people with disabilities. Amnesty recently reported that children and young people are disproportionately affected. To uphold the rule of law, and indeed to be a truly free and democratic society, the UK must afford adequate protection of fundamental human rights. In the view of the influential judge Thomas Bingham: “a state which savagely represses or persecutes sections of its people cannot in my view be regarded as observing the rule of law” (Thomas Bingham, The Rule of Law, Allen Lane, 2010). Without this, he claims, the rule of law would be stripped of its virtue. The Conservative government has now pledged to proceed with its plans to abolish the Human Rights Act. The Act puts the European Convention on Human Rights into direct effect in the UK. The Convention, which came about in the aftermath of World War II to protect future generations from atrocities, protects basic rights and freedoms such as the right to life, right to liberty, freedom of expression and the prohibition of torture. The British Bill of Rights, set to replace the Human Rights Act, will very likely state that the rights of an individual will depend on their immigration status. But surely a right cannot be fundamental if it discriminates in its application. 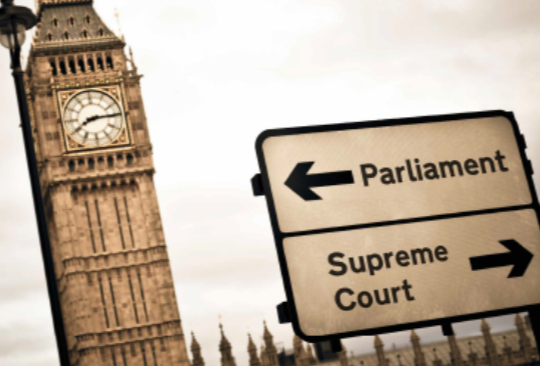 If the abolition of the Human Rights act goes ahead, basic rights will become privileges. A society upholding the rule of law guarantees its people a fair trial. This is about open justice, equality of arms, lack of bias and a presumption of innocence. But the UK’s counter-terrorism measures corrode some of these most valued principles. Incredibly, a UK citizen can now have their liberty substantially infringed by controls on their movement, communication and financial activity without being charged with a crime and without knowing the case against them (Terrorism Prevention and Investigation Measures). While secret courts (or Closed Material Procedures) mean trials can be held in private, without the relevant individuals being present, where evidence is discussed between ministers and judges with details never being disclosed to the accused. The violation of the right to a fair trial imposed by counter-terrorism measures doesn’t just affect ‘others’, it has a very real, and very scary impact on our liberty and constitution. In the words of Lord Hoffman in the Belmarsh 9 case:“the real threat to the life of the nation, in the sense of a people living in accordance with its traditional laws and political values, comes not from terrorism but from laws such as these. That is the true measure of what terrorism may achieve. It is for Parliament to decide whether to give the terrorists such a victory”. There are ways in which the UK legal system remains strong and robust. We have an impartial and independent judiciary and our laws are relatively clear and stable. This is why the UK is often the go-to jurisdiction for international disputes. However, justice in its truest sense is about the ability of the impoverished, the marginalised and the hated to fight, with equal arms, against the wealthy, the powerful and the popular. If a legal system does not protect the most vulnerable people in our society or even just ordinary people, it surely cannot be considered just. And an unjust system does not uphold the rule of law. It is hard to avoid the conclusion that our much-admired rule of law and the rights and freedoms that generations have fought to achieve are being squandered. We are compromising our justice system for austerity and a narrow view of national security. The time to oppose these changes is now before they become the ‘new normal’. It is important that we clearly understand the impact of these changes, and of draconian counter-terrorism measures, on our national values. The Legal Aid Sentencing and Punishment of Offenders Act 2012 is a huge part of the access to justice problem and should be urgently reviewed. We must mobilise to fight the abolition of the Human Rights Act to protect our fundamental rights and freedoms. We must fight to protect access to justice and the integrity of our justice system.